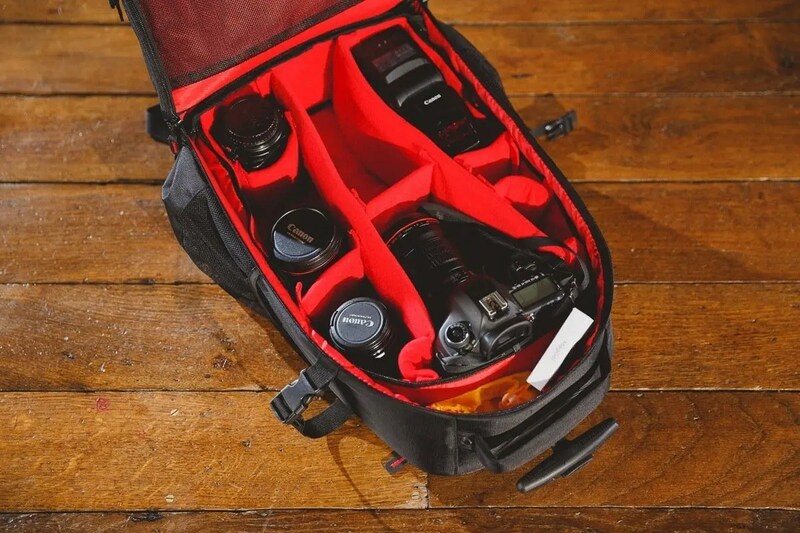 You’re not a photographer if you don’t have 15 more camera bags than you actually need. I literally have a cupboard full of camera bags, much to Mrs Gibson’s dismay. 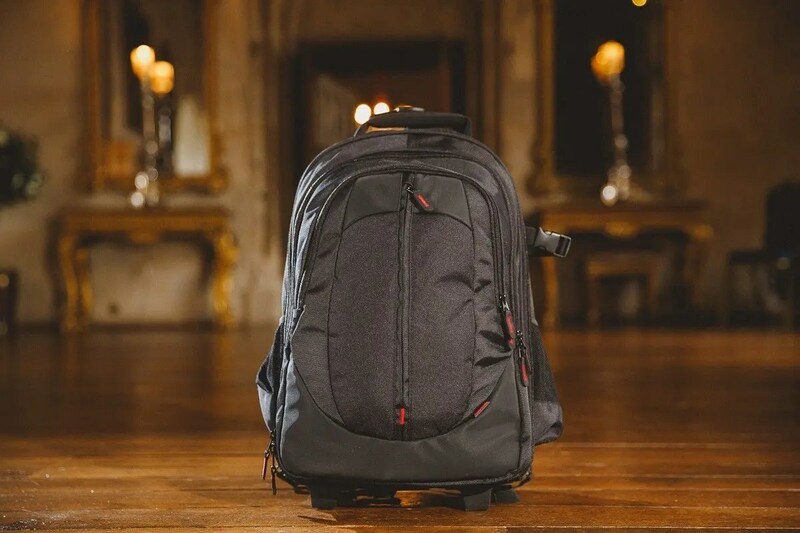 It’s notoriously hard to find the right bag for every occasion – what works for a trip out with the family won’t work at a wedding, and what works at a wedding won’t necessarily work on a corporate job where you’ve got to bring in a variety of lights and other gizmos. So obviously when the folks from lovecases.co.uk got in touch to ask if I wanted a bag to review, I said yes. Thank you. And they kindly sent me a trolley/backpack bag to keep and review, as I’ve been wanting to trial one for a while. I’ve been taking it on a mixture of shoots now for the last 2 months and have had a good chance to get to know it and see what works and what doesn’t. I usually religiously use ThinkTank bags, so it was refreshing to try something completely different for a change. The Hama Miami 200 has proved to be really useful and fitted into my workflow really well. First of all the outside – pretty inconspicuous. Which is a good thing. A solid feeling to the external material with some nice red detailing on the zips which is mirrored by the inside lining. The trolley handle is a little lightweight – I’m not sure that it would hold up to serious international travel over and over. I think a lot of trolley bags suffer from that problem though so it’s definitely not unique in that respect. What is good about this bag is that you can also use it as a backpack, so it’s really flexible. Although the straps are really meant for temporary use, so they’re not overly padded, they’re still surprisingly comfortable. The bag has a really good selection of interior front space, so there’s plenty of room to store chargers, batteries, torches and a 15 inch laptop too. The inside of the bag is nicely padded and a pretty decent size. Although it’s not quite large enough to fit in everything I’d like, it does mean the bag stays a decent weight and doesn’t end up over-filled and too heavy. One of the slight issues I have with the bag is that the inner padding section, where you’d store camera lenses and bodies, doesn’t attach to the outer part of the bag, so it’s technically loose inside the main compartment. I think I’d prefer it if the inner padded section had some way of attaching to the edges of the bag. It’s a minor niggle – but I felt if you were doing some full on travelling with it then you’d want everything a bit more secure inside. The inner padded insert does have a zip over top cover mesh, so that does go some way to alleviate those worries. 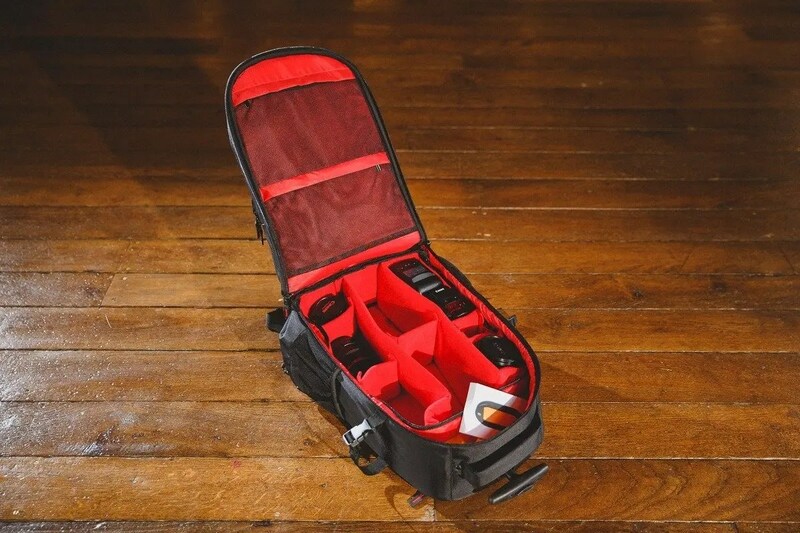 The padded insert has easily configurable sections which you can change to fit whatever bodies and lenses you’re using for a particular job. The thing I’ve really found useful with this bag, which I was missing by just using shoulder bags before, is that there is a way to strap a couple of manfrotto nano lightstands to the side of the bag. It really makes it much easier to get all your gear in and out of a venue in one trip. 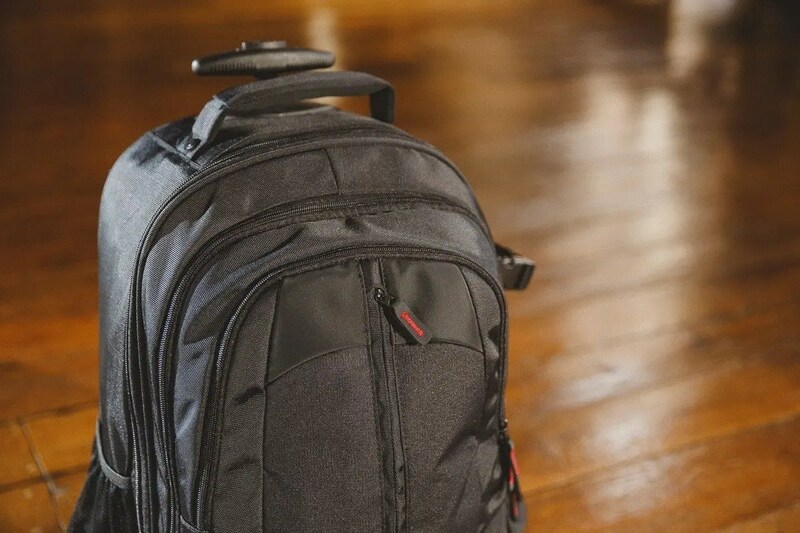 In conclusion – if you’re looking for a versatile backpack bag that you can also use as a trolley, this is a pretty solid and inexpensive option. There’s a few things that could be improved – the addition of a rain cover, and some way of securing the padded interior to the external walls would be great – but at the price it’s a great performer.